February is all about preparing for the coming spring. From Groundhog Day to Lent, the focus of this short month is readying ourselves for the glory of springtime (or at least reminding ourselves that it is coming so we can get through the month). 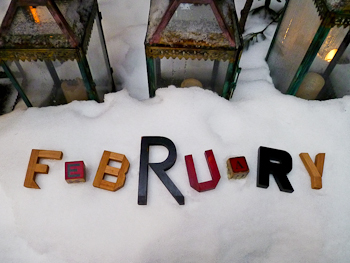 A look at the etymology behind all things February confirms that this is an age-old tradition. The “month of purification” is an appropriate time for another February occurrence, the beginning of the Christian observance of Lent. A time of fasting, self-denial, prayer, and repentance, Lent is observed over the 40 days between Ash Wednesday and the beginning of the Easter feast. The Gospels tell the story of the 40 days Jesus fasted in the desert, resisting temptations from Satan and preparing to begin his life of public ministry. In commemoration, Christians prepare themselves for the coming Easter by fasting or abstaining from certain luxuries or foods. When the Latin mass was translated into the English vernacular, Quadragesima became Lent, a name with etymological roots that emphasize the coming of spring. It’s based in the Germanic langa-tinez or “long days,” a reference to the increasing daylight that accompanies the coming of spring in the Northern Hemisphere. In fact, the current word for the season of spring is lenz in German and lente in Dutch.